Modern Group AZ » Innovative Tile and Flooring That Will Last! Innovative Tile and Flooring That Will Last! Are you ready to take advantage of a product with unprecedented efficiency and value? Schluter-Systems provides a multitude of Tile and Stone installation products that were designed by tile setters, for tile setters. When properly utilized these products will vastly benefit the builder, designer, architect, and homeowner. 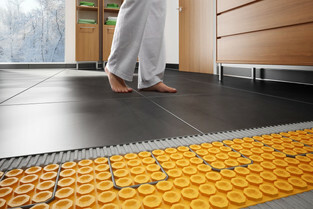 The Schluter-Ditra is one of Schluter-Systems most innovative products. The Ditra is an uncoupling membrane that is primarily used for flooring, and prevents cracked tile and grout by providing separation between the tiling layer and the substrate. The unique design of the Ditra allows for movement in the substrate without cracking the tile or wood. Additionally, this product is extremely versatile and ready to be tiled immediately after it is installed. Getting a new floor is an investment, and the Ditra protects your investment. 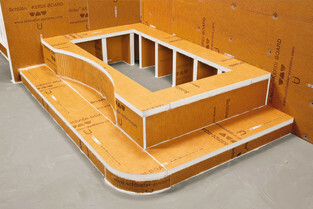 The Ditra product line recently took it a step further in the uncoupling membrane category with the Schluter-System-Ditra-Heat. This uncoupling membrane is designed to easily integrate customized, comfortable electric floor warming with all of the same functions associated with the Ditra. The design of the Ditra-Heat allows for heating cables to easily be laid through studs in the uncoupling membrane for a significantly quicker installation, as well as a quality finished product. 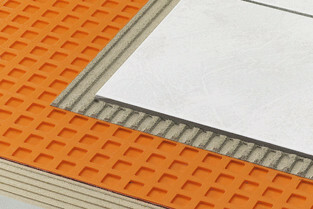 The Schluter-Kerdi Board is a multi-functional tile substrate and building panel. It can be used to build tile ready elements in showers, counter tops, vanities, and bathtub platforms. The Kerdi Board stands apart because it is pre-waterproofed and can be cut and assembled however you see fit. A shower bench can be entirely constructed using only Kerdi Board and thin set. This includes supports and waterproofing materials. According to one of our tile specialists, building with the Kerdi Board is 4x as fast as mud setting. It is very light and easy to transport, it does not require an extra waterproofing membrane, and it can be tiled the same day it is installed. If the testimonials and sheer performance of Schluter-System products don’t prove these as the best tile and flooring installation products on the market today, then their confidence in their own products will. Schluter-Systems has a generous 10 year warranty on projects where the their products are properly installed. They are so confident in their product that they are willing to back it through all the wear and tear tile or flooring takes over a 10 year period. All of Modern Groups tile and flooring installers go through a 2-3 day training course where they are Schluter-System certified so that we can ensure the job is done to perfection and that you are covered by the warranty. Modern Group‘s top shelf inventory, in combination with years of industry leading installation and setting services, is the perfect complement to Schluter-Systems innovative products. This dynamic partnership allows creates an unprecedented synergy that allows us to very efficiently execute high-end customized projects that we can guarantee will last for many years. Posted on Friday, March 11th, 2016 at 4:22 pm and is filed under Press.